Several aspiring young chefs chat quietly while putting on their uniforms: white coats, white caps, neat purple kerchiefs. They wash their hands and line up for chef Keio Gayden, who inspects their dress and the cleanliness of their fingernails with a steely eye, calling out one student for the choker necklace under her kerchief. It’s a scene common in culinary schools, but it’s also part of the curriculum at Miller Grove High School. Located in southeast DeKalb County, Miller Grove is big and modern—the largest high school in the district. The population is 96 percent black and 76 percent low-income, and a majority of students receive free or reduced-price lunch. Yet the school sends 69 percent of its graduates to college or vocational school, on par with the state average. And for more than 10 years, one of Miller Grove’s bragging rights has been its culinary program. For an industry where 16 percent of chefs are black—and for a majority-black city whose chefs don’t accurately reflect the population—Gayden’s program presents an all-too-rare opportunity: It gives young black women and men a competitive edge. After lineup, the students head to the gleaming instructional kitchen. They’re upperclassmen in the third and final course of Miller Grove’s culinary track, and their lesson today is a surprise. Like on the TV show Chopped, they must use a mystery basket of ingredients to cook a dish without a recipe. Unlike on Chopped, the kitchen must be returned to its spotless condition when they’re done. The students scurry to put pots of water on burners. Gayden paces between the neatly spaced stainless steel tables as the teenagers begin to prep the mystery ingredients—a different pasta shape for each team, a variety of cheeses, precooked meats, and fresh herbs—occasionally offering hints to nudge the students in the right direction. Chef Keio Gayden instructs students on a challenging pasta dish. When Gayden took over the program 12 years ago, the scene was far more chaotic. “I was the fifth teacher the kids had seen that year, and it was just November,” she says. She didn’t have a teaching license, and she took a pay cut from her prior job as a recruiter for Le Cordon Bleu. But the change allowed her to travel less and spend more time with her children. And in short order, she was able to transform the program into a vanguard for high school vocational training. She has secured corporate sponsors, renovated the instructional kitchen, and, most importantly, helped many of her students find careers in the food world. “I can honestly say I came to school because I wanted to go to her class,” says Dominique Gooden, 21, now a line cook at Yard House, the sports pub in Atlantic Station. He began cooking professionally shortly after graduation thanks to Gayden, who introduced him to Richards. The chef immediately hired him at Richards’s Southern Fried in Krog Street Market. By the end of the mystery-basket class, the kitchen is again sparkling clean, and five finished pasta dishes are ready to be tasted—including stuffed manicotti made by a student who nearly quit in frustration. After class, Gayden says of the student, “She’s a perfectionist. She just got a little flustered.” A month later, the same student participated in a demo at Taste of Atlanta, cooking alongside professional chefs. Gayden’s success at Miller Grove has influenced curricula statewide. 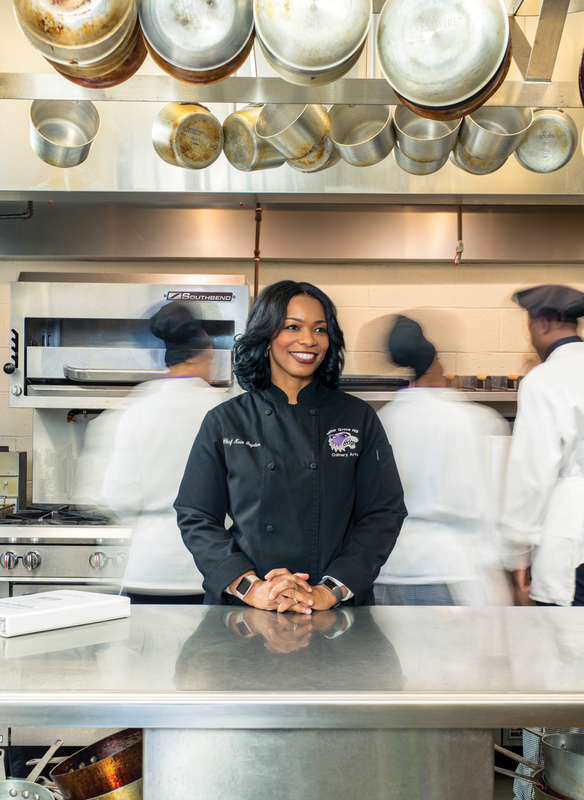 Her kitchen was one of the first four in Georgia to be accredited by the American Culinary Federation, and 17 more state schools have followed suit. But perhaps a greater accomplishment is the effect she’s had on her students.